Capillary Electrophoresis (CE) is a powerful analytical technique used to separate compounds and is increasingly being used in routine analytical laboratories. 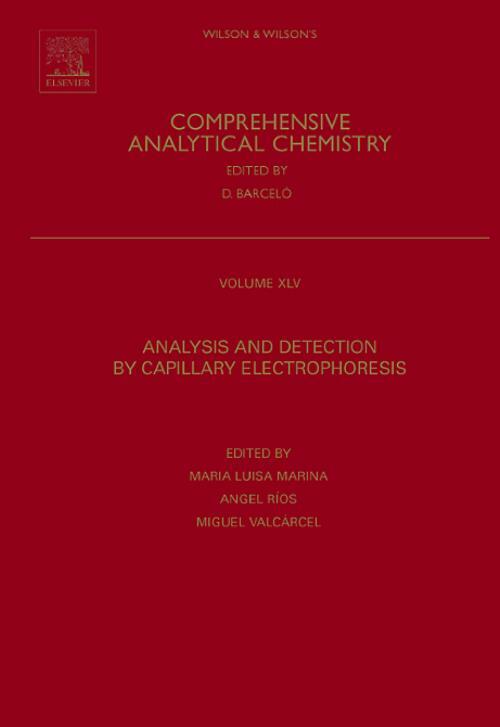 Analysis and Detection by Capillary Electrophoresis presents developments enabling the enhancement of the detection sensitivity in CE, including the different strategies used to achieve sensitivity requirements. It describes techniques allowing sample preconcentration and sensitive continuous detection systems and looks at recent developments such as chiral analysis in CE and electrochemical detection in microchips. UV-Vis absorbance detection, as the most widely used detection system in CE, is also presented. Analysis and Detection by Capillary Electrophoresis delves into the practical approaches used in the field and will greatly benefit analytical chemists, as well as students, teachers, technical analysts, scientists and researchers involved in capillary electrophoresis. 1. Fundamentals of capillary electrophoresis. 2. Separation modes in capillary electrophoresis. 3. On-line sample preconcentration techniques in capillary electrophoresis. 4. Coupling continuous flow systems to capillary electrophoresis. 5. UV-Vis absorbance detection in capillary electrophoresis. 6. Fluorescence detection in capillary electrophoresis. 7. Novel optical detection techniques in CE based on phosphorescence or chemiluminescence. 8. Electrochemical detection in capillary electrophoresis. 9. Mass spectrometry detection in capillary electrophoresis. 10. Inductively coupled plasma-mass spectrometry for specific detection in capillary electrophoresis. 11. Vibrational spectroscopic detection in capillary electrophoresis (CE). 12. Coupling NMR to CE. 13. Chiral analysis by capillary electrophoresis. 14. Electrochemical detection in capillary electrophoresis microchips.